QC-CALC Real-Time 3.0 now has the ability to export directly to StatGraphics Centurion XV when installed on the same PC. As with our other SPC outputs, QC-CALC doesn't just output the results to a file to be imported into StatGraphics. It actually launches StatGraphics and places the results directly in a table. Simply export your QC-CALC data the same way you normally do any other export. In the export type drop down list, choose StatGraphics Centurion. When you click the Export button, StatGraphics will appear with all data loaded. It doesn't get any easier. If you have QC-CALC Real-Time 3.0, you don't need to purchase anything. Just update your software via the Help > Run Update menu. Once you have updated to 3.0.240 or above, the new StatGraphics export will be available. QC-CALC now supports the new AIAG QMD standard for both import and export. Specifically, we have implemented ClassOne, ClassTwo, and ClassThree. Prolink will be presenting and giving demos at the AIAG booth at the Quality Expo if you would like to stop by and see it in action. By default, QC-CALC Real-Time sets the control limits at 80% of the tolerance when a new QCC file is created (the first part of any new inspection routine is run). This is done because there isn't enough data to statistically calculate the control limits when a new file is created. Therefore, setting them to 80% becomes more of an early warning system rather than a true control chart. 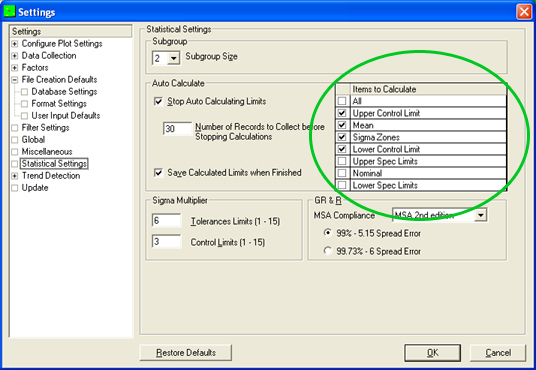 The good news is that you have several options for calculating control limits as well as other limits. You can easily calculate an individual dimension's statistical limits by right clicking on the plot in Real-Time and choosing Calculate Limits. This is a check mark menu, so repeating the process will flip it back to the original setting. Tools > Calculate Limits. Again, choose it a second time to turn it off. You can tell QC-CALC to automatically calculate the limits for all dimensions of a part by choosing Tools > Auto Calculate Limits. This will cause the limits to be re-calculated as each new part arrives until a specified number of parts. It will then lock the control limits. 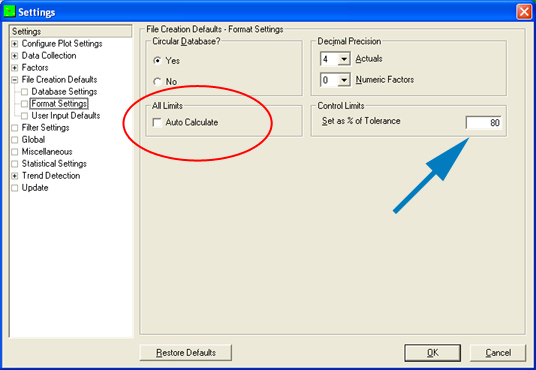 You can change QC-CALC's default behavior above to always auto calculate the limits when creating a new file. This can be done by choosing Tools > Options > File Creation Defaults > Format Settings. If you check the Auto Calculate box (circled at right in red), all new QCC files will auto calculate the limits rather than setting them to 80%. You can change the default % of the control limits on new QCC files. Choose Tools > Options > File Creation Defaults > Format Settings. Change the value of Set as % of Tolerance (as shown on the top picture with blue arrow) to your new desired value. You can change the items to calculate by choosing Tools > Options > Statistical Settings. On this screen, you can check the items in the list that you want to calculate in the Items to Calculate list (circled in green in bottom picture).